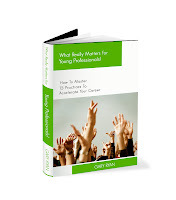 A Second Edition of What Really Matters For Young Professionals! How to master 15 practices to accelerate your career has just been released on Amazon Kindle. Even more exciting is the price – just US$4.97. The timing is perfect for anyone who has just finished their university year or degree. However, the book isn’t just for people who are at the start of their career – seasoned professionals have found the content of the book extremely useful for helping them to do the little things that help them to continue their success. The book isn’t just for Kindle Readers either – if you have an iPad or other tablet you will easily access apps that will allow you to read your Kindle books on those devices. You can access your own Kindle version of What Really Matters For Young Professionals! here. More information regarding the book, including a short video can be accessed here. I am confident that you will find this version of the book even more value than the first. Enjoy! Til next time, please keep learning and be the best leader that you can be! Listen to a short interview on the Business Success Podcast hosted by Annemarie Cross. Annemarie is a Branding Specialist and Business Coach and recently requested if I would be happy to be interviewed on her Business Success Podcast show. How to build a top performing team, and much more! Please take the time to listen to the short interview here. The What Really Matters For Young Professionals! Online Course is a 16 lesson program that takes the content of the book to the next level. Each lesson is designed to take between 10 to 30 minutes to complete and is delivered directly to your email inbox. Links to materials that can be then downloaded and used over and over again, as well as presentations and short videos are included in the lessons. I recommend that you create a special email folder for the course so that you can refer to the lessons again and again. While the content for the course is exactly the same, three different course durations are on offer. You simply choose the duration that best fits your situation. You can even purchase the course for a family member or friend – I bet that you have never thought that personal and professional development could be offered as a gift! Who knows, with Xmas around the corner this might be the perfect and unique gift that you could give someone. More information regarding the course is available here. 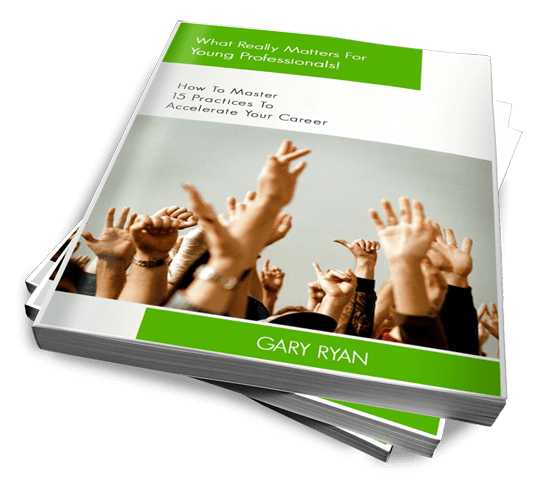 A free ebook version of What Really Matters For Young professionals! All of this for just AUS$99. Please feel free to email me at Gary@orgsthatmatter.com if you require more information. In the second of our Leadership Insights Series webinar recordings, Gary Ryan interviews Cecilia Chan, a young professional experienced in providing consulting services related to business process management, process design and analysis, process simulation and enterprise architecture. In this 30 minute webinar you will learn about Cecilia’s strategies to progress her career throughout her first five years of employment. You will also learn about the benefits that volunteering provided Cecilia in enabling her to initially break into the workforce, as well as the benefits that can be gained from being a pro-active networker. Secrets of Young Achievers Exposed is a book featuring 12 of Australia’s brightest young talent. This free ebook includes two chapters of the book and features Amy Wilkins creator of Active Kidz and Hugh Evans, founder of the Oaktree Foundation. Dale Beaumont, one of Australia’s most successful author’s is one of my mentors (even though I’m ten years older than him!). Dale provided direction and guidance in helping me to publish my first book What Really Matters For Young Professionals! In this webinar recording Gary Ryan explains the research that underpins employability skills, what each employability skill actually means, and how to capture your own stories for each of the skills. Parasuraman, Zeithaml & Berry introduced the SERVQUAL framework in 1985. It is essentially a process that describes five potential service gaps that organisations should minimise if they want to be known for consistently delivering service excellence. Minimising each gap contributes to an organisation’s capacity to meet or exceed the expectations of its customers. The gaps are described below with an examples provided to help you to understand what each gap ‘looks like’. A gap can exist between managements understanding of customer expectations and the actual expectations of customers. If management get this wrong, everything else they do will be wrong and the service gap is likely to grow exponentially. Organisations must do everything in their power to minimise the chances that Gap 1 exists. Cocac Cola has dominated the soda drink market for decades. yet, in the early 1980s Coca-Cola decided to introduce ‘New Coke’ (some of you will remember, many of you won’t.) The tatse for ‘New Coke’ was supposed to be a modern taste that the ‘consumers wanted.’ Nothing could have been further from the truth. Coke sales plummetted. Management had clearly misunderstood their market and had made a series of poor decisions as a result of their misunderstanding. It is one thing to be able to understand the expectations of those you serve. A gap can then emerge if your translation of those expectations into service standards is inaccurate. Service standards are effectively the systems and processes that you put into place to ensure that you can consistently meet the expectations of your customers. This is very easy to get wrong and requires a high understanding of the expectations of your customers, as well as a high level of understanding of how your organisations works if you are to minimise this gap. An example of Gap 2 in action is provided by a quote from a research participant. The person was a fitness centre manager. In this example, niotice how it connects to the concept of Structure Drives Behaviour. After all the systems and processes have been created, both the automated and human elements of the system must do what they are supposed to do. System errors or breakdowns and humans not doing what they are supposed to do can create immediate service gaps. No system or human is perfect or infallible. As such your organisation must consider what it will do if a Service Delivery Gap does occur. A retail operation requires staff to work from a start time to a finish time. Usually there will be a staff member who is responsible for opening the retail outlet at a certain time. If that staff member is late then the retail outlet may not be open when customers expect it to be open. In this example, human error is responsible for creating a service gap. Ultimately your staff have to do the right thing. It’s important to have the best systems and processes that you can, but ultimately your staff have to do the right thing. They have to properly implement what they are supposed to do. If you say that you will respond to online customer feedback within 24 hours and you consistently take 48 hours to do it, then you have created a Market Communication Gap. The local barber who cuts my hair has two signs out the front of his barber’s shop. One sign says that the shop will be open at 8:30am. The second says 8:45am. The barber is rarely there before 9am. He has no idea how many people have looked in his window when he wasn’t open when he advertised that he would be. My expectations are consistently not met. One day a new barber will move into an empty shop in the shopping strip. What do you think I will do? Sorry mate. I know that I said sorry the last couple of times but my car broke down and I had to wait for my wife. Sorry mate. The final gap is the perceived service quality that the customer has of their total experience in relation to their original expectation of the product or service. Ideally there is no gap here or, if there is a gap, it is in the context that the perceived service level is higher than original expectations. Unfortunately, the four previous gaps can create a significant negative gap at Gap 5. I describe this gap like this because service providers are often unaware that this gap exists. As such they don’t do anything to close this gap. This leaves them exposed to a competitior or new service provider from appearing to ‘steal’ their customers ‘overnight’. The reality is that their customers were simply waiting for a better alternative to ‘pop up’, so when it did they ‘defected’ as quickly as they could. Do you think my barber (Gap 4 above) is at risk of this occuring? A similar gap can exist for internal service providers. I am aware of teams of internal staff who have failed to provide high service standards to others within their organisation. When their service has been ‘outsourced’ those staff and team members have become indignant. “How dare they outsource our department!”. Yet they had not been prepared to ‘see’ other staff as their ‘customers’ and treat them accordingly. You know they don’t really have to do all that much. If they just met my expectations I’d be happy. But they really don’t seem to care. And as soon as I get a chance to go somewhere else I will. And they won’t even know what happened to me. It’s a shame, really. It doesn’t have to be that way. Your challenge is to be aware of these five gaps and to be pro-active in managing them. This is a never-ending activity because customer expectations can change ‘overnight’. Please share your experiences with relation to how you have managed the five service gaps. Mentoring is experiencing a resurgence as more and more people are recognising its benefits, from both mentor and protege perspectives. Recently I facilitated a mentoring workshop for one of Australia’s largest universities. Part of the workshop included a Strategic Conversation. The purpose of which was to generate some resources for the 60 mentors present. “As mentors or proteges, the most powerful and effective questions that we have asked or have been asked are…?”. I have received permission to be able to share the output of the Strategic Conversation with you. Please click here to download the file. I would like to be able to continually add to this list. In this context, please share the most powerful questions that you have been asked or have asked in the context of a mentoring relationship. PS My first book What Really Matters For Young Professionals! is due for release on July 30th, 2010. In this context I have a pre-release Special Offer available. Over my journey a number of mentors provided me with books as gifts to assist me with my development. If you are a mentor then this may be the perfect gift for your proteges, especially if they are in the first ten years of their career. You might like to consider an even more powerful gift which is the Online Course that supports the book.